On his first day of school, Michael is crushed to learn that his dog Cookie can't come with him, until his sympathetic teacher convinces him that he will be happier if Cookie waits for him at home. Welcome to Mrs. Connor's first-grade class at Robin Hill School, where newly independent readers from ages 4 - 6 can delight in familiar classroom experiences. Short and appealing stories with repetitive vocabulary and colorful illustrations make this series the perfect introduction to reading and listening. 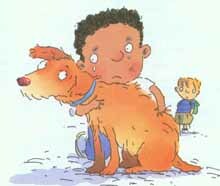 On his first day of school, Michael is crushed to learn that his dog Cookie can't come with him, until his sympathetic teacher convinces him that he will be happier if Cookie waits for him at home.